NYCC 2018: Hellboy panel with David Harbour and Mike Mignola – AiPT! We got to listen to the cast talk about this project and saw some exclusive footage. Hell has come to New York City and people couldn’t be happier about it. Today at New York Comic Con, David Harbour, star of the upcoming Hellboy remake, stopped by with co-stars Sasha Lane (Alice Monaghan), Daniel Dae Kim (Ben Daimio), and Hellboy creator Mike Mignola. Clark Collis, senior editor at Entertainment Weekly, was on hand to make the best effort at moderating the panel. 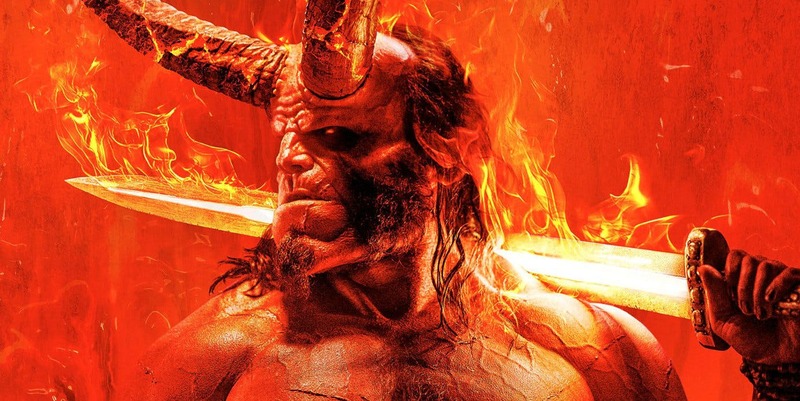 In addition to listening to the cast speak on their experiences while working on the film, the audience was treated to the first ever look at the exclusive Hellboy footage. Spoiler alert: It was incredible and I can’t wait for them to release it for the rest of the world to enjoy. “NOW? It took you until now to believe it’s happening?”, cut in Harbour with a burst of laughter from the audience. “Well, I auditioned for Sasha’s role but for some reason, I didn’t get it. I came onto this project after a good friend of mine, Ed Skrien, stepped away from the project and they were looking for someone and I happened to be available.” Kim said. “I joined and I’m so glad I did. I’ve become a big fan of Mike’s work. Seeing an Asian American in these comic books is–” Kim was unable to finish as the audience cut him off with an extremely loud applause. “I don’t want to give anything away. She’s very bad but very good from her perspective, which is what I like in a villain.” Mignola said on Milla Jovovich as the Blood Queen. Jovovich was unable to attend the panel due to filming for a new movie in South Africa, but she did drop in through a prerecorded video message. “I play the Blood Queen. The script portrays her as the villain, which I resent. She just wants to be friends with Hellboy. Right, David? Nah just kidding! She wants to kill everyone and everything. So excited to see her make it to the big screen. Thank you for the support,” said Jovovich. “Sasha is like my sister. I’m so glad we got to be friends and she got to be part of this with me,” Kim added. “Having these two with me made me feel so comfortable. I fell so in love with Hellboy when he took the costume off and it was just David I was like ‘oh, you’re okay,'” Lane shared. “There’s a lot of CGI but there’s also a LOT of practical stuff. This is a monster movie.” Harbour proceeded to then mock people who complained online about Hellboy being all CGI. “Ya know, like Thanos.” The audience erupted in laughter. “I do lament that the film industry uses CGI exclusively now — I prefer practical effects and you’ll see a lot of that here. Joel Harlow [is an] Academy award-winning effects artist. The entire Hellboy costume is real, except for the flaming sword on his shoulder,” added Harbour. “We did a few different makeup tests and some were better than others. I really wanted to get into this guy, but I couldn’t wear the makeup every day, so I went to a sports store and bought a boxing helmet and glued things onto it. I bought hockey pads, a wetsuit and built myself a suit. So, for three weeks I rehearsed in a homemade Hellboy suit and it really helped so once I got into the actual costume, it just felt like a second skin,” Harbour said on preparing for the role in a costume that took two and a half hours to get fully on. “I would eventually like to hang the right hand of doom in my apartment. Joel said he might make me another one,” Harbour said on what he would have stolen from the set if he could have. Before the panel ended, the cast took questions from the audience and one question in particular really got Harbour riled up. A fan asked if we should expect to see other members of the B.P.R.D. in the film, such as Abe and Liz. “Oh, I want to say something so bad but Lionsgate said I couldn’t! You guys know my reputation with Netflix and Stranger Things for spoiling things.” After making several frustrated grunts and noises, Harbour finished with “You might see someone from B.P.R.D.” and did a hand motion like Pac-Man chomping.